I got my copy of Mac OS X 10.5 earlier this week. Bought it from J&R (via Amazon) since it was $99 + shipping, less than Amazon itself was selling it for. For some reason both of them are able to undercut Apple (even with a corporate discount) which seemed odd. Here’s my rundown of the new OS during the first 24 hours. Apple’s packaging has always been known for being better looking and easier to use (no need to rip it apart, easy to get stuff out). Unlike Mac OS X 10.0 – 10.4, Leopard uses a new smaller box. It’s about the size of the DVD box Apple ships with the Mac Mini (and I believe the iPod has a similar box). On the front is an eye catching holographic cover. Inside is one DVD set inside the cardboard sleeve (rather thick) unlike the plastic/paper cover used in previous boxes. Also inside are the standard Apple stickers and a rather thick color book going over new features in Leopard. The photos are a little small, but good enough for the explanations. In an age where most manuals for software are in PDF format, a physical manual is a real luxury. I decided to do a clean install on my Mac Mini (rev 1 G4 @ 1.4GHz 1GB RAM) since I installed 10.4 on top of the stock 10.3, and lots of stuff has been installed over the years. I made two partitions one for Mac OS 10.3 (so I can try running 10.3 with Classic), and the main partition for Leopard and my data. Install went very smoothly really nothing to complain about. The OS DVD has improved since 10.4. The first great enhancement is that it now can partition without reformatting (technology first seen with the Boot Camp public beta’s). I choose to zero my drive anyway, but it’s nice to know I can adjust partitions. Also interesting is that if you look at the top right side of the menu bar, you can see that WiFi is available on the installer. Not exactly sure what you would use it for, but you can connect to an access point. Overall it took over an hour until I was ready to restart into Leopard. Initial restart brought me to the first launch video “Welcome” obviously redone for Leopard. Setup went as expected an I was on my desktop without any pain. Afterwords I put in the Mac OS X CD that came with the computer and installed the apps that came with it (AppleWorks, iMovie HD, GarageBand). Also very painless So now onto the toys. Overall the look and feel of the OS is great. The most obvious change is the newly remodeled dock. I personally think it looks pretty nice, but maybe that’s me. Since I’ve got a Mac Mini with an ATI Radeon 9200 (a mere 32MB) I don’t get some of the more fancy graphics/animations such as the semi-transparent menu bar that’s so controversial. Regardless it looks good. Rounded menu’s are a nice little bit of polish. Coverflow is an interesting way of browsing media. I didn’t expect it to work on my Mac Mini because of the weak graphics card, but it actually works pretty well. It did however consume a bit of CPU, and disk IO was a little high so if you went to fast, the images weren’t always preloaded. Still handy. Stacks are rather handy, especially for downloads. 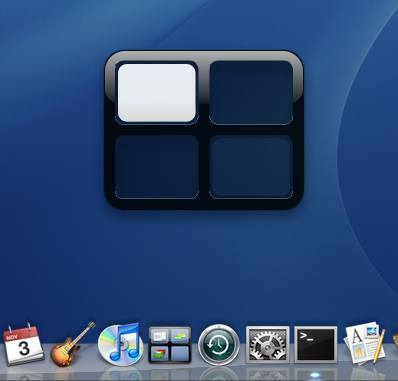 Not having them clutter the desktop is a major win. In just a few hours I can see how great this feature will be in the long term. Downloads are also tagged (similar to IE on Windows) so you’re prompted the first time you open them. 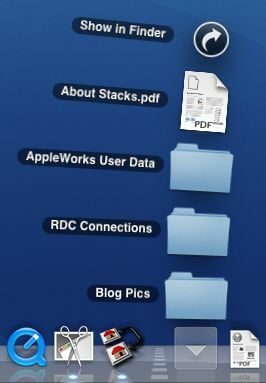 I’d love to see the ability to turn a folder on the desktop into a stack (for easy access). The new sidebar is really good, it makes things even easier to access with less clicks. Notable is that it found my file server and make it a breeze to connect to. I can’t complain about that. Scrolling windows that are not in the front is also a great usability tweak. The Path bar, disabled by default (In the view menu select “Show Path Bar”) is great for keeping track of where you are. Adjustable grid spacing = awesome. Really fast, and really awesome. I can see myself using it quite a bit. This is definitely a time saver. Ability to go full screen is just a bonus. It looks like Apple did some tweaks to how it handles fonts. Most obvious is that the default minimum for anti-aliasing is now 4px, down from 8px (which looked bad on a few websites with smaller fonts). The fonts look a little more crisp than they did before, but still feel much smoother than they do on Windows. I think it’s a significant win. I didn’t really use Spotlight to much on my Mac with Tiger. With Leopard I think I will. It seems good enough to get rid of QuickSilver which I have yet to install. You can indeed use it to launch applications. Indexing didn’t take to long, search is pretty zippy. The one feature I really wanted most was Spaces. I love the feature of multiple desktops when using Linux and really love that Apple adopted the innovation. The spaces implementation is pretty good, it’s in the dock for easy access, also available in the menu bar and via key commands. Easy to use. The one thing I would like to see added is a graphical representation of what’s in each space on the icon. So I know what spaces are occupied and what are empty like Linux does. This is a minor thing. Overall it’s great. Mac OS X 10.5 Leopard ships with Safari 3.0.4 (5523.10) installed. Perfect for downloading Firefox. Kidding aside it’s fast and sleek. Nice additions include the ability to resize a text area on a form (Firefox extension will do the same). Also new (and very handy) is Web Inspector. Dashboard didn’t change much, but there’s now a feature (in conjunction with Safari) called Web Clip which lets you select a piece of a web page and turn it into a widget. Not a bad idea, but I doubt I’ll be using it much since I don’t really use Dashboard that much to begin with. Front Row is now available for those computers that didn’t ship with it, such as my Mac Mini, but without a remote I’m not sure how useful it would be without the buying a remote such as the Keyspan ER-RF1. Lots of little stuff, but until CalDAV is a more accepted standard and accepted by Google and friends, it’s mostly useless to me. I don’t use Mail to often, but on occasion I play with it. Forward as an attachment is finally available. RSS integration isn’t bad, but not very powerful. In no way would replace Google Reader. Archiving mailbox isn’t such a bad idea. Could use that in Thunderbird. intuitive. It also seems faster with large files. Lots of new features I’ve yet to play with. I was able to setup my networked HP DeskJet without a problem. Wasn’t the greatest quality or the fastest but good enough. I wish HP would provide good drivers themselves, but they are still trying to push their overpriced JetDirect system. I can always use my Laptop to print so it’s never been an issue (can also print to PDF for easy transfer). The terminal now has tabs! My #1 request for a long time. Yes there are third party replacements that add this, but those are buggy at best. This officially makes Terminal cool. Everyone’s favorite text editor now supports OpenDocument and Word 2007 Formats. Other than that, I don’t see anything too noteworthy, just polish (smart quotes, auto linking, etc.). All work very well. I haven’t tried time Machine since I don’t have an extra drive large enough at the current time. I don’t keep much data on my Mac since my PC laptop is backed up frequently. As a result I mount the drive when I need something. Works well enough. This might change things though. So much for reviewing the most talked about feature right? Overall the performance of Leopard on a 1st generation Mac Mini is extremely good. I personally think it feels more responsive than Tiger and Panther did. You won’t see the fancy animations or graphics (it still looks stunning though), but it’s very usable. I originally thought it might be a little sluggish based on the discussions of optimizations for Intel based Macs, but Apple seems to (for now) still care at least a little about PPC users. Panther/Tiger let me put the computer to sleep and switch to the other computer on my KVM switch. As long as the switch was done pretty quick the computer just went to sleep. Leopard doesn’t like this. The workaround is to switch, wait about 10 seconds then hit the power button once to put the machine to sleep. When switching back to my Mac, Leopard doesn’t see a mouse and prompts me to connect a bluetooth mouse. Obviously my mouse exists, but it’s USB and my KVM doesn’t emulate hardware. Not a major problem, but a little annoying. See below for instructions how to disable this. Safari seems to have become a little more memory hungry. Might be a leak, I only have 1 tab open. See comments for instructions how to disable this. Time Machine doesn’t let you use network volumes to backup. Would be the best option of all. Not a quirk but something that’s “missing”: Still no ability to use iCal to write to Google Calendar. So that’s all for my initial impressions with Tiger after almost 24hours. I personally really like it, a worth while upgrade. Can’t wait until I can upgrade at work. It’s by far the best OS Apple has ever put out. Having played with Vista I can safely say it is a much more functional, easy to use, and more powerful OS. It’s clearly designed with the user in mind. Edit [11/4/2007 @ 10:15 PM EST]: There is a way to disable the bluetooth input device prompts. I’m sure you know about this, but in case you don’t… SpanningSync is a great utility for syncing iCal with Google calender. It works perfectly and can sync both ways. It’s a little pricey at $25 a year or a $65 one time charge. Dave M.: I’ve seen it. But it’s not a good choice for me. Why is it a service and not a download? Do they want access to users data? IMHO something like this needs to be client side. Just my $0.02. i am a long time Apple user–from iPhone, to iPod, to iBook, to Mac Pro, etc., etc., etc. However, i am amazed at the accolades that Apple is getting for Leopard. i couldn’t wait to get my hands on it and had it on pre-order for months. But, i was amazed when i installed it how simple usability has declined with this “upgrade.�? Stacks, for example, removes the capacity to pull a folder (or an entire hard drive for that matter) into the dock and to be able to thereby easily navigate the subfolders contained therein. Stacks appears to go only one level deep, so the user has to open the folders to then dig into subsequent ones to obtain the file being searched for. Then there is that silly Windows-like drive-bar that shows up in every single folder that is opened in the finder. Like this is necessary? Not only is it ugly, but it makes every single window far larger than it needs to be. In 10.4 this side bar could be hidden by a simple click in the folder window on its pane, but now, the only way to rid oneself of it is to collapse the entire tool bar (and it still has a habit of showing up). This annoying side bar causes folders to be entirely too large, ugly, and to take up screen real-estate. The cover flow? Again, one level deep. And when clicked on, the folder that is chosen appears BEHIND the coverflow folder. How useful is this? Time Machine? Although you can tell it what you DO NOT want it to back up, you can not tell it what you WANT it to do. For example, i can’t tell it i want it to watch specific folders on my hard drives to back those up rather than backing up the entire hard drive. The download folder? Fine. But what idiot didn’t know how to designate a folder to place all their downloads into in the first place? Please. This OS has lots of “pretty�? features. But these features hardly increase ease of use, nor do they increase productivity. In my estimation, Apple has sorely screwed up with this outright UGLY thing they refer to as an “upgrade,�? Just to let you know, you can disable the Bluetooth prompt that appears when you don’t have any input devices connected. To do this, open the Bluetooth system preferences then push the “Advanced” button and turn off the option to “Open Bluetooth Setup Assistant…”. Hope that helps. Wade: Thanks for the tip. I’ll give that a shot. You mention: “but without a remote I’m not sure how useful it would be”. But it seems that’s one can use a keyboard (bluetooth, if you want to be across the room) and Front Row’s keyboard access commands to evoke it and watch content, not needing a remote. I am taken by Gene Surber’s sensibilities about ease of use. Last month my Ruby OS9 found itself sharing the house with a 20″ Tiger. While my OS10 learning curve is slowly flattening out, I continue to be frustrated and annoyed by the delays to directives from my mouse. (clicking a bookmark into action, manipulating text.) And often enough a sublime laid-back copacetic outlook is not enuf – I find myself bailing out and coming back to the darned click-on action. Nonetheless, about Winter solstice time, I expect that a spotted Leopard will muscle striped Tiger aside. Poor Tiger. Poor Ruby. Definitely a few things pulled from the beta. Maybe they’ll show up in later updates? I miss the floating window for the clock.